Kalzang Monastery (Tib. བསྐལ་བཟང་དགོན་པ་, Wyl. bskal bzang dgon pa) was founded by Nyala Pema Dündul in the centre of Nyarong in 1860. During the consecration, Nyala Pema had seen a vision of all the thousand buddhas of this aeon, the ‘Good Kalpa’ or ‘Fortunate Age’, dissolving into the site. So he named the monastery Kalzang Sangyé Chöling, “Dharma Sanctuary of the One Thousand Buddhas of the Fortunate Age”. In time, Kalzang Gonpa became the seat of Tertön Sogyal, and with the assistance of the Thirteenth Dalai Lama, he expanded the monastery and filled it with many sacred images and scriptures. 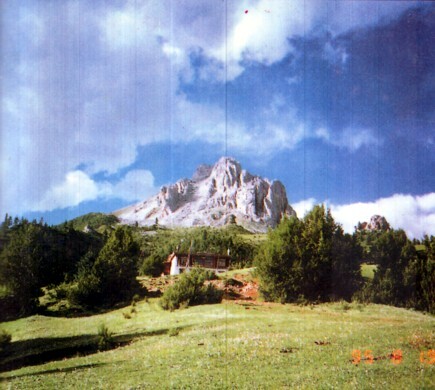 On August 12th 1998, Sherab Özer Rinpoche performed a simple, symbolic ceremony in Lerab Ling in which he offered the throne of Kalzang Monastery to Sogyal Rinpoche as the heir to Tertön Sogyal.